The protesters, which number in the thousands, have been fighting to halt the construction of a $3.8 billion oil pipeline which would desecrate lands sacred to the Standing Rock Sioux and threaten the health of local water supplies. The police have been openly violating human rights with their intimidation tactics, setting attack dogs on protesters, sexually humiliating protesters with strip-searches and cavity exams, and arresting hundreds on trumped up charges. After that failed to break the spirit of the protesters, the police escalated the violence last week when they deployed tear gas, concussion grenades, and rubber bullets into the crowds of resisters. One protester had her arm amputated after a shell brutally tore her muscles apart and another may lose her sight from the tear gas. They followed that up with water cannons in sub-zero temperatures, causing hundreds to be treated for hypothermia. The police have now announced they will be blocking food and medical supplies from reaching the protest camp and have ordered them to disperse by December 4th. Tribal leaders have rejected the evacuation order and will not back down. 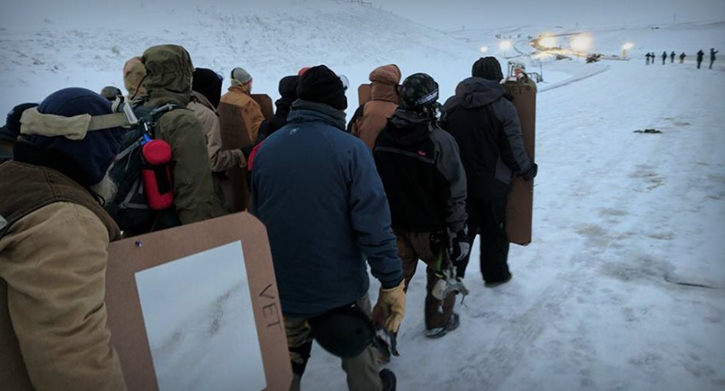 A two legion strong group of veterans, some having walked thousands of miles to reach the site, will “self-deploy” themselves in a “human shield” to protect the innocent protesters. While the media obsesses over Donald Trump’s tweets, unconstitutional brutality has been playing out in North Dakota. We applaud our brave veterans for their determination and wish them the best of luck in the face of the unfeeling boots of an oppressive Republican regime. Thanks to Ruth Hopkins for images. If you’d like to donate to the veterans at Standing Rock, you may do so here.